A few weeks ago I spoke on Nehemiah 8 and how the Word of God does the work of God. If we want to know and experience God we need to read his word. And when we read it we don’t need to come up with new and clever insights. We need to understand the plain meaning. That is what the people did in Nehemiah’s day and what we need to do today. I pray that a movement of Christians reading their Bible with others would begin. We need to take seriously our call to share the word with others and help them understand it. If you give an amen to that but need some help knowing how to do that then you should read David Helms simple book One to One Bible Reading. It is a short book that shows you why you should read with other and he also gives helpful advice on how to lead such a study. Whether you are doing a family devotion, reading with a skeptical coworker, or going deeper with an old friend Helm’s advice will be very useful. 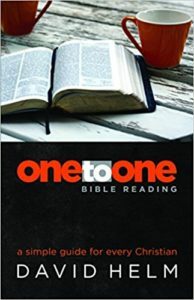 One of the most helpful parts of the book is on pp 43-48 he gives a series of questions that aid in understanding a passage and applying it to life. Another aid is the book recommendation and suggest chapter breakdown of how to study them. Its a great aid for those looking to go deeper in the relationship with God and relationship with others.